本トンネルに新たに採用した主な施工技術は(1)超膨張性地山に対しては、独自の技術を導入した多重支保工の確立、(2)高圧帯水層の未固結地山に対しては、３段階のボ−リングデ−タから切羽の評価と以降の掘削サイクルに取り込んだ切羽管理技術の開発、(3)可燃性ガス胚胎層に対しては、ガスの検知、希釈の掘削サイクルへの取り込みである。その結果、安全で安定した掘削進行を実現することができた。 Iiyama Tunnel, located on the Nagano-Niigata prefectural border, is 22.22 km long, the longest tunnel on Hokuriku Shinkansen and the third longest tunnel in Japan. 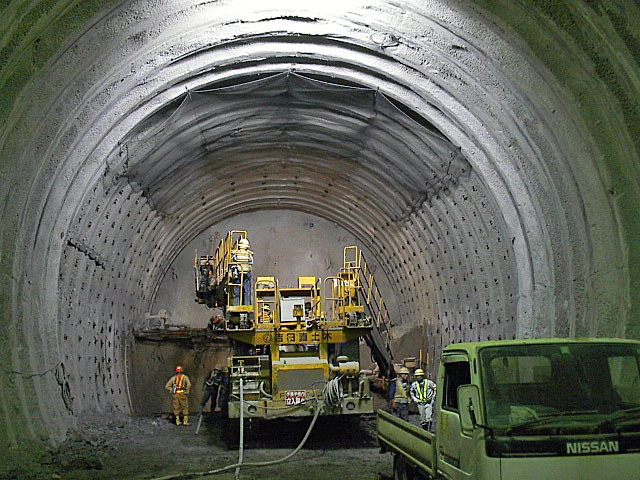 In this project, safe tunneling technologies were developed. To reduce ground settlement in the areas of excavation in squeezing rocks, “multiple-layer supporting method” was devised. To carry out excavations easily with high groundwater pressure in unconsolidated ground, an advanced management method with three types of probe drilling and face ground evaluations was established. To safely excavate rocks containing flammable gases, appropriate gas detection and dilution systems were conducted.